I often speak of the independent author community to which I belong because I have never met such an excellent group of people who are willing to answer questions and point new authors in the right direction. Some people stand out and belong to an exceptional category of writer-mentors. Sally Cronin is part of this group of novelists who spends much of her time highlighting the work of others. My thanks to Colleen for creating this wonderful series, where we as writers, can share our more magical and other worldly experiences. The way many view magic is that it is trickery, and a skill that is learnt. This also applies to other less logical events that all of us will experience in our lifetimes, including vivid dreams, strange encounters with others and deja vu. That feeling that you have already lived through an experience that is happening in the here and now. They say that our memories are formed in the womb when we hear our mother’s voice or music. As we get older, we tend to discard memories that are non-essential, filing those that are embedded in us, by the intensity of the moment when they were formed. I certainly have very clear memories from about the age of two as I grew up immersed in the sights, sounds, and aromas of other worlds. From a baby, until I was nearly four years old we lived in Sri Lanka, or Ceylon as it was in those days, and our house was filled with the smells of spices and sounds of the surrounding jungle. There were many dangers for a toddler including leopards, large monkeys, and snakes. My amah’s role, apart from being my nanny, was to protect and teach me how not to become dinner for other creatures! We went on to live in Malta and South Africa returning to England when I was eleven, brimming over with the sights and sounds of these amazing countries. I had also become confident and adapted easily to new environments, which on reflection made me a little too cocky for my own good. I have other memories that are definitely filed away in the ‘What in heaven’s name just happened?’ drawer. Have you ever found yourself on the brink of committing to an act or words, and something seems to hold you back? Did you ever wonder why you misplaced the keys to the car and were delayed for ten minutes; head out, only to pass by a serious car accident along the route. Have you been asked to make a decision that is critical to your well-being, only to find yourself saying ‘yes‘ despite your reservations, and for it to turn out positively? There are a large number of events in my life that fall into this strange vacuum between thought and deed, and I would like to share one or two of these experiences with you. Despite my worldly confidence gained through my travels, I was not as clever as I thought. This became apparent when I got married at twenty to someone quite a bit older than I was and far more experienced. Despite friends and family trying to tell me that this was a mistake, I pushed forward determined to have my own way. A few weeks before the wedding, I came out of a supermarket, to find an old Gypsy woman selling sprigs of heather in the rain. She was holding out her dirt encrusted hand to me and thinking that I probably needed all the luck I could find, I gave her sixpence and waited for my heather. Instead, I found my hand gripped very tightly in hers with the silver coin between our palms. She pulled me into her, and I can still smell the sweet slightly musty scent of this dishevelled old woman. She whispered to me as I tried to pull away. With that, she released my hand, and I found I was still holding my sixpence as well as a sprig of heather. I looked up in a state of confusion to see her walking away in the rain. When I was in South Africa, I had a nanny who would tell us bedtime stories about her tribe’s history and myths. Many of those stories had been about long dead ancestors who would stand guard in the shadows; protecting the living from danger. That had been 10 years before; yet here was this gypsy woman reminding me of those memories and issuing a warning. Whilst it did make me pause for a moment or two, with the arrogance of youth, I dismissed the experience and went on to get married as planned. I should have listened, as seven years later, when I was mentally, emotionally and physically drained, I finally took action. However, when I look back at the events that unfolded over the next two years, there were definitely hands other than mine holding the reins. Desperate for work to support myself, I bought a copy of The Lady Magazine, and one job leapt out from the page. I found myself applying for the position, despite the fact I was looking at completely different occupations. I got the job. Two years later I discovered that my past was about to catch up with me again, and another job caught my eye in an edition of the same magazine, hundreds of miles away in Wales. I sent them a photograph and my CV, and without an interview, I was offered the job as assistant manager at a large hotel. Two years later on 16th September, a man rang the hotel and asked to book two rooms for himself and a colleague. He had a soft Irish accent, and when I put the phone down, I turned to the receptionist and commented that I thought that I would marry the man with that voice. She laughed and commented that I was nuts! I met the guest on his first night when I showed him to his table in the dining-room. Over the next nine days, I arranged a number of meetings for him and his colleague and also found myself being increasingly drawn to him. He was due to leave on Tuesday 25th September but asked to be booked in for another two nights. At this point, he was still Mr. Cronin. He asked me for a drink on the Thursday night, and we sat in one of the lounges. After chatting for a few minutes, he gave me a small box which contained a Welsh pendant, along with a note thanking me for my help ‘Over and beyond the call of duty.’ He also asked me if I would like to have lunch with him the next day, as he knew I was off duty. Because of my previous experience of this alleged state of bliss, I had made a vow never to marry again following my divorce on April Fool’s Day of that year. (I kid you not) and to this day, I swear that someone else put the word ‘yes‘ in my mouth. I married this virtual stranger six weeks later, and as we got to know each other, we discovered that our paths had in fact crossed once or twice before. This brings me to where it gets interesting. The week before my wedding seven years previously, David went for an interview in the same office as my father, who was working for the Ministry of Defence. He stayed overnight on the seafront at one of the hotels, and the week after my wedding he turned down the offer he was made for the position. He asked me to marry him on the anniversary of my first wedding which was more than a little spooky. The hotel that he stayed in for that night before my first wedding was the one mentioned in my divorce papers, as frequented by my former husband for assignations. Two weeks before he had booked into the hotel in Wales, we had been visited by the manager of the Talbot Hotel in Wexford. We were putting together a reciprocal agreement to recommend our respective guests to each other. The day that David booked in and I showed him to his table, I was using a Talbot Hotel pen that the manager had given me. He commented on the coincidence as Wexford had been his home town and he had started work there at weekends and holidays as a hall porter at the age of fourteen. So, do I have a guardian angel that has been protecting me all this time and trying to steer me in the right direction? Who has nudged me to take action when I needed it, put jobs in my path that would lead to where I needed to be? Attempted to prevent me making mistakes by putting the right man in the picture… Twice? Or, is it the belief that we have a guardian angel that makes us question decisions and make better choices? I don’t know for sure, but in the last 37 years, I have listened to that inner voice a lot more than I used to; accepting that someone has my back, chipping in from time to time when I needed help. And here we are in Wexford, in a house that was not in the right section of the website that I was hurriedly searching for properties on. A house that popped up as we were wondering where we should live for the rest of our lives. A property that had been already sold several weeks before, but two days after my inquiry, the sale mysteriously fell through, and we viewed and put in an offer. On the way to the viewing, we left the motorway behind a Walsh’s Mushroom lorry, and I mentioned to David, that my mother, whose maiden name was Walsh, was obviously in favour. We stopped for coffee at the harbour, in a cafe called Flanagan’s, which is David’s mother’s maiden name. The young lady who served us coffee lived in the house we were about to view, from the time it was built by her parents until they sold it ten years ago! There have been many more incidences over the last 37 years since I accepted the help being offered. Some of which have drifted into my stories that have been published. I am not sure how well my African warrior is dealing with the Irish weather, but hopefully, he will not be deserting me anytime in the future. And it would seem that he is in good company with others who appear to be looking out for us. Thank you again, Colleen, for allowing me to share my story on your wonderful blog. Today, I would like to feature Sally’s newest novel, recently released, July 25th, 2017. Please click the link below to read a sample from the book. Our legacy is not always about money or fame, but rather in the way that people remember our name after we have gone. In these sixteen short stories, we discover the reasons why special men and women will stay in the hearts and minds of those who have met them. Romance, revenge, and sacrifice all play their part in the lives of these characters. Kenneth watches the love of his life dance on New Year’s Eve while Lily plants very special flowers every spring for her father. Martha helps out a work colleague as Norman steps back out into the world to make a difference. Owen brings light into a house, and Patrick risks his life in the skies over Britain and holds back from telling a beautiful redhead that he loves her. Sonia is an entitled princess whose father has reached the end of his tether and Theresa has to deal with a bully in the checkout. Usher is an arrogant narcissist with a docile wife and is used to getting his own way, and Vanessa worries about the future of her relationship with her teenage son. Walter is a loner and is happy with just his dog for company, Xenia is the long awaited first baby of a young couple. Yves is a dashing romeo who has the tables turned on him unexpectedly and Zoe… Well, she can see into the future. In one way or another, all these characters will be remembered by those whose lives they have touched. My name is Sally Cronin, and after working in a number of industries for over 25 years, I decided that I wanted to pursue a completely different career, one that I had always been fascinated with. I began studying Nutrition and the human body twenty years ago, and I opened my first diet advisory centre in Ireland in 1998. Over the last 18 years, I have practiced in Ireland and the UK as well as written columns, articles and radio programmes on health and nutrition. Sally Cronin has written numerous books. Please check out her Amazon Author Page to learn more. Thanks for stopping by to meet Sally Cronin. ❤ What about you? 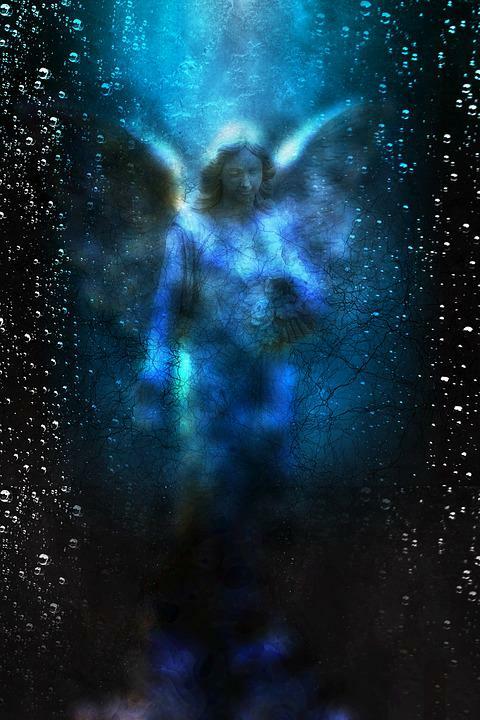 Do your guardian angels intervene and help you in your life? Let us know in the comments. Nice to meet Sally and her books. Fascinating post, Sally. For people as science-based as we are, we seem to share a belief in unseen forces and unexplained synchronicities. I had a similar and surprising, “I’m going to marry that man” thought that simply popped into my head upon our second meeting. In our first, he actually walked into the space where I had just moved, without knocking, thinking his childhood friend from whom I was renting was working downstairs. He did ask me to marry him shortly after that, and I accepted, startled to hear the words come out of my mouth. I was warned away from this particular man at a party – by a friend of the hostess who actually made her living as psychic. I did not listen – as with your first marriage – or believe, actually, because he seemed like such a great guy. Another friend of a friend, an astrologer, warned me away as well. Too “woo woo” for me to take seriously in either case. A third warning came another way – too much to attempt to describe in a comment. Fortunately (or un-) he began to show his true colors before we tied the knot and I practically ran away following a particular disturbing incident about which there could BE no second guessing. The time I spent with him nearly broke my spirit, and my mental health took quite some time to recover. Interesting to learn more about the backgrounds of the bloggers we only believe we know from their blogs, huh? Thanks for hosting Sally, Colleen. I’m sure this will prove to be a fascinating Series. Made the same choice, Sally – a privilege and benefit of aging, I firmly believe. I’m glad the second time was the charm for you. We women seem to need matchmaker spirits, don’t we? So many stories about meeting those bad boys on our own. lol 33 years now is incredible! Congratulations to you BOTH. I wish you many more. Great to meet you too. May all the spirits on both our roads be benevolent. It’s great to see Sally here, Colleen. I have followed her blog for a while and knew some of the things she mentions, but seeing them all together, indeed it seems as if somebody is looking after her. Great new feature, Colleen. What a lovely post, Sally and Colleen. Your whirlwind romance is really amazing. I knew my hubby for four years before we got married so such a short courtship is remarkable. I must add, Sally, that you had the most lovely hair in that photograph, so thick and pretty. Terrific to read of Angels working in someone’s life! Sally’s experiences give me chills and put a smile on my heart! What an amazing story! It sure does make you wonder, doesn’t it? Many thanks for sharing this, Colleen. All I can say is, wow! Fate or guiding spirits-either way I’d have to say you’ve been blessed, Sally. Your life would make a fantastic movie, lol. Many thanks, Colleen, for sharing as well. It’s always a treat to visit your lovely site. I think someone is definitely watching out for you Sally, there are far too many incidents for it to be coincidence alone. Fantabulous story Sal! And Colleen my sis, so great to see Sal here at your beautiful blog. Fascinating story, Sally! You are an amazing woman with an enormous amount of unbelievable life stories. No wonder you are so amazing! I believe in listening to my inner self. Sally, you too are no less than a Guardian Angel for Indie writers. Wonderful post. I knew some of Sally’s story but she has an amazing way in slipping in one or two new details each time so I’m always learning more about her. I love the way ‘coincidences’ (or whatever) take us in directions we never expected. Colleen and Sally- Brilliant brilliant brilliant! It is true there are more things on heaven and earth. And rationalist and materialist as I want to be, with hand on heart, I can never bring myself to say there are not powers (I call them that because I have no idea what they are) watching over us and guiding our footsteps. Sometimes bad things happen because a greater good lies in our future and when we come together with our (quite literally) other half and wonder why it didn’t happen years before, all I can think is that if it had happened when we were younger we might not have been ready and we might have messed it up. There is fate and there is a point and purpose… we mightn’t see it and we certainly don’t have to like it, but I think it is a path we are made to travel none the less, for whatever reason… Who knows? I am sure it all becomes clear in the end. Colleen, thanks for hosting Sally and for sharing the snippet from her book. Sally — what a marvelous telling! I’ve read before your story of meeting David. But I haven’t seen the first part about your first marriage and the gypsy. As TV’s Gibbs would say “There are no such things as coincidences,” but I love hearing about them. Hugs on the wing! Have a happy relaxing Labor Day. More hugs. Great big hug, my friend. An amazing number of co-incidents! There’s certainly something else in charge.